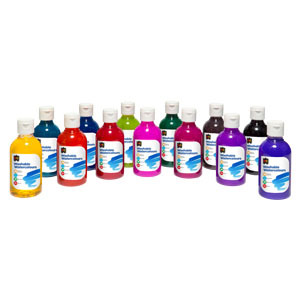 EC Washable Watercolours provide brilliant colour and supreme versatility. These watercolour paints are washable from skin and fabrics. The EC Washable Watercolours paints provide a stress (and mess!) free medium for watercolour painting, tinting pigment or craft dye. Suitable for use on paper, cardboard, glue, fabric, wood & wool, EC Washable Watercolours are applicable with brushes, spray bottles, droppers and sponges.